World-renowned DJ and production duo Tale Of Us have revealed their 2018 Ibiza plans for their acclaimed party series Afterlife. Whilst they will be returning to the original place where the residency was launched under its current guise of Hï Ibiza, the parties themselves promise something different and adventurous. The residency will be taking over both rooms, with music and production concepts designed for each space. The lineup has been carefully curated into a singular musical journey, and also includes renowned visual artist Quayola. Whilst some of the most popular names in Ibiza are in attendance - Dixon, Nina Kraviz, Maceo Plex and Ben Klock to name just a few - the residency is notable for its large roster of underground and upcoming artists, some of whom have never played Afterlife before, such as Jon Hopkins. Tale Of Us have also tapped genuine pioneers of the scene; Carl Craig, Robert Hood and Alva Noto (who plays a special live concert) will appear alongside Afterlife regulars like Mind Against, Agents Of Time, Adriatique and Woo York. Running every Thursday from the 28th June right through to the 4th October, Tale Of Us’ Afterlife 2018 looks set to be a game-changer for Ibiza. With more details and lineup breakdowns still to be announced, as well as an elegant series of artworks commissioned for the season, this residency will cement Tale Of Us’ reputation as forward-thinking curators in addition to their well established status as genre-leading producers and DJs. To mark the club’s second season and to celebrate you, the clubber, Hï Ibiza has realigned its ticket price structure for the coming season launching with a special Super Early Bird Ticket valid just for 7 days. This is your chance to take advantage of the best ticket prices available and make planning your summer much easier. 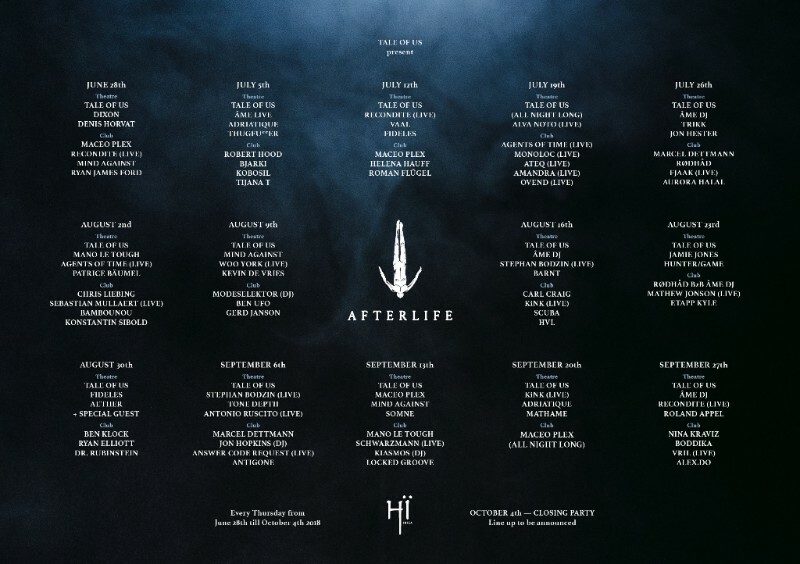 Following the announcement of a full club takeover and return to their original island home of Hï Ibiza, world-renowned DJ and production duo Tale Of Us have revealed their 15 weekly programs for the forthcoming season of their acclaimed party series Afterlife. This year’s line-up has been carefully curated into a singular musical journey, encompassing the melodic dancefloor sound Tale Of Us are best known for as well as more experimental and darker techno. The program includes some of the most popular names in Ibiza, with Dixon (28th June), Nina Kraviz (27th September), Ben Klock (30th August) and Âme (26th July, 16th August, September 27th) just a few of those set to appear on Thursday nights. The residency is notable for its large roster of underground and upcoming artists, some of whom have never played Afterlife before, such as debutant Jon Hopkins (6th September) and for pioneers like Carl Craig (16th August) or Robert Hood (July 5th). Another tantalising addition is Maceo Plex, who becomes a key player with four sets planned, including an ‘All Night Long’ session in the Club room on 20th September. As usual, the Afterlife regulars and label artists are also in strong presence like Recondite, Mind Against, Adriatique, Vaal, Woo York, Agents Of Time, Patrice Bäumel and more. An annual special night for Afterlife Ibiza falls on Carmine of Tale Of Us’ birthday, July 19th, when Raster-Noton luminary Alva Noto will begin the night with a special live concert before Tale Of Us play all night afterwards. Details on the season-closing party on October 4th are yet to be revealed, but judging by the huge, three-room takeover Afterlife held for closing last year, it is set to be quite the finale. 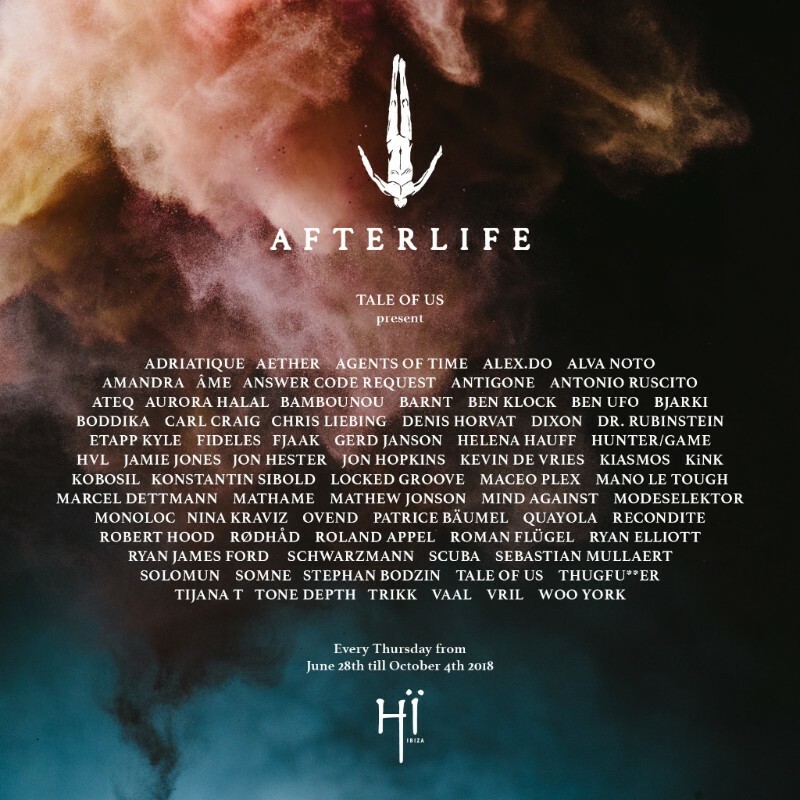 Running every Thursday from the 28th June right through to the 4th October, Tale Of Us’ Afterlife 2018 looks set to be a game-changer for Ibiza, cementing Tale Of Us’ reputation as forward-thinking curators in addition to their well-established status as genre-leading producers and DJs. Book ahead at hiibiza.com.